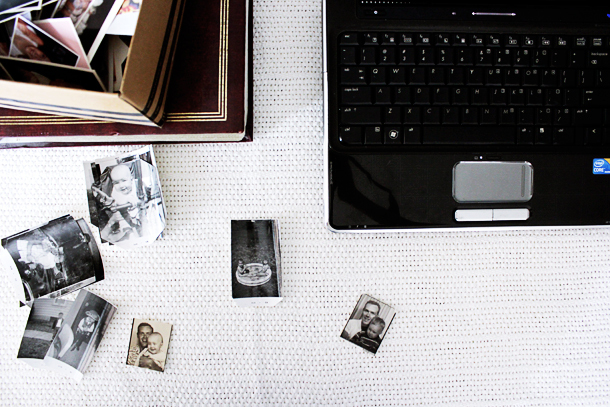 The photographs my family and I have collected are one of my most precious possessions. They are extremely valuable to me. I've been trying to come up with a way to save the photos digitally (in case anything happens to the originals) and print them to be enjoyed. A while back, I saw Elise's post about revamping her family albums and I've been wanting to do it ever since. I finally decided that it was time to sit down and plan it out. People have been asking me about my project, so I wanted to share it with you here in easy steps. I will warn you that this is a big project. It's very time consuming. My family has thousands of photos, so organizing all of them is definitely not a weekend project. And many of the supplies I'm using are not cheap. The hard drive alone is pretty pricey, but I'm thinking of this as an investment and a way of preserving all my family photographs. 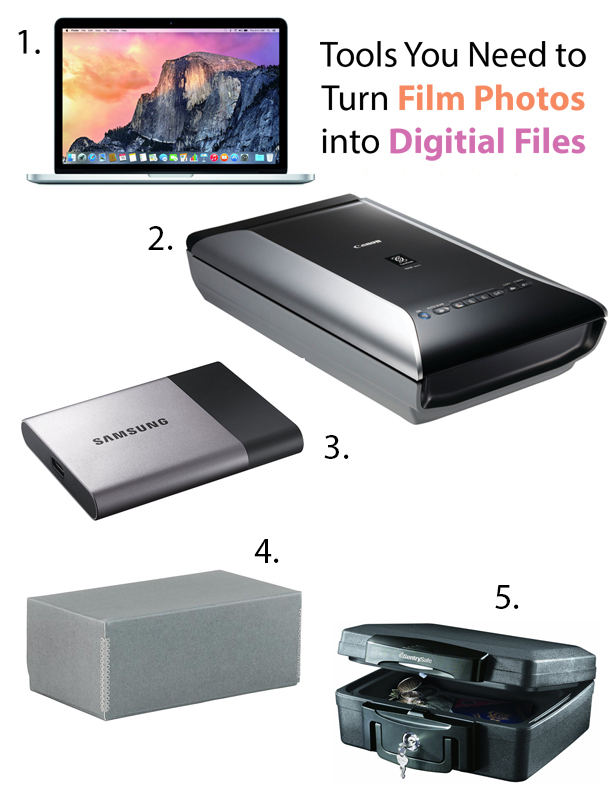 Here are my five tools that I've been using to scan in my film photos and turn them into digital files. Not only will this help preserve the photo in case something happens to the original, but it will make it easier to print and share them with other family members. 1. A computer. This can be Apple or PC, desktop or laptop. 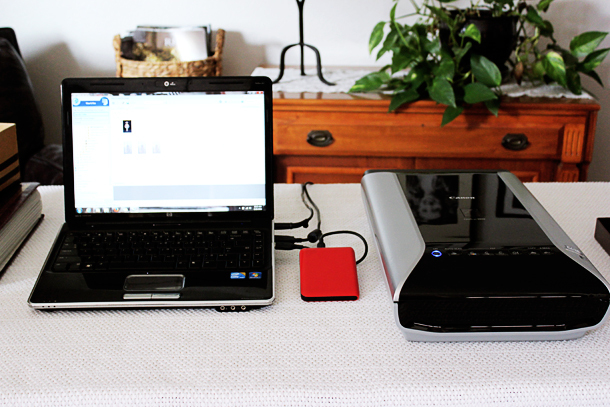 It doesn't matter as long as you can use your photo scanner software and organize files with an external drive. 2. CanoScan 9000F. I love this scanner. The software is easy to use and I've been happy with the quality of photos that it scans in. If you don't want to use this scanner, make sure you get one that is a photo quality scanner, not a document scanner. The photo scanner can capture higher resolution photos than the document scanner can. I always set mine to the highest settings, so I get the biggest photographs. That is my personal preference, but to save space you can save a lower setting. Play with your scanner to see what works for you. 3. External hard drive. I'm currently using a hard disk drive (HDD), but will soon be upgrading to a solid state drive (SSD). The solid state drives are significantly more expensive, but since they have no moving parts they are less luckily to break down over time. This is really up to you, but I recommend purchasing a high quality hard drive to protect your files. 4. An archival photo box. There are many types of photo boxes, all with different prices. 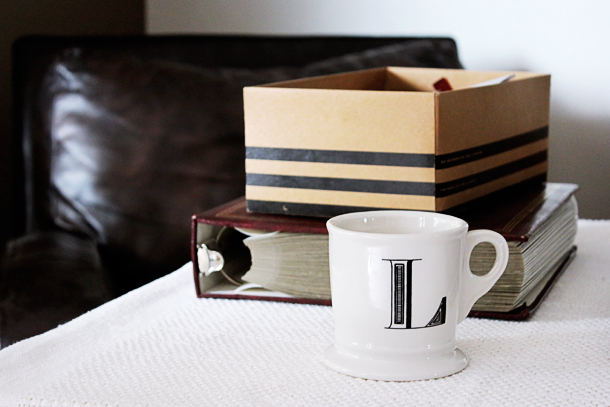 Like the hard drive, I recommend getting high quality photo boxes to preserve your photos. The one linked in this section is a great box for storing and protecting your photos that won't go in your album. 5. A fire and waterproof safe. There's really no point of putting all your photos on a hard drive, if that hard drive isn't protected. If you have a fire or flood, the hard drive will be damaged along with the originals. I think it's important to have a small fire and waterproof safe that you can store your hard drive in. I never thought flood protection would be necessary for me, until my basement recently flooded. Life happens and it's important to keep your files stored in a safe place. Now that we have our tools, let's get started with scanning! Before I began, I set up my photo scanning table. I knew I would be scanning in a lot of film photos, so I wanted a comfortable place to be that I didn't need to take down often, so not the kitchen table. 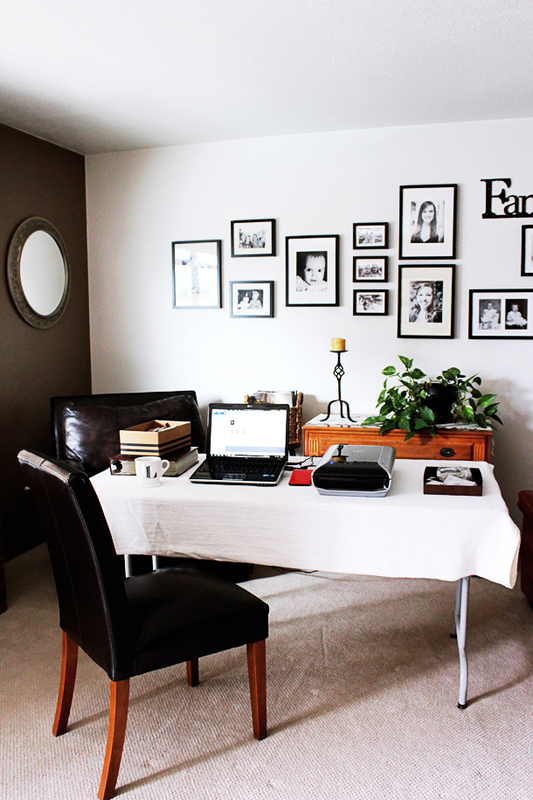 I wanted this space to be big enough to spread out and keep the photos safe. I set up a folding table in the living room at my parents house. The table was kept in the garage, so I covered it with a blanket to help keep the photos clean. Next, I added my photos to be scanned, my laptop, and my scanner. And coffee, but not near the photos! Then I just sit there and scan! Once I have a decent amount scanned in, I sort them into the right folders on my hard drive. I try to add as much info as possible to the file, like the date, location, who is in the photo, etc. as I can. I made one folder for each year in my hard drive. And in each of those folders is a folder for every month. So I have a 2014, 2015, and 2016 with January-December in each of those. I sort the photo into the correct folder and save it. My older folders like 1960 are smaller. Some of the older years have one or two months in them, if I knew what month the photo was taken. If I didn't know, the photo just went into the 1960 folder. I've tried to update all the files to have the date and sort them into the right folder, so searching for photos is easier and if you send them to someone they can also have the date information. This process is very time consuming. I suggest doing this project with a family member, so they can help you and you can have someone to chat with. Also, watching tv or listening to podcasts while scanning helps the tedious work easier.